One fine day I got an e-mail searching for Busch Gardens Ambassadors - bloggers willing to visit Busch Gardens Tampa, FL, a division of Sea World Parks & Entertainment, on Busch Gardens' dime and blog about it. Heck yes, I applied. This May I was chosen to be a Busch Gardens Ambassador. Have no doubt ... this was one house full of happy! We packed up the minivan and headed to Busch Gardens Tampa Bay. And had nothing but fun, fun, fun. The new roller-coaster, Cheetah Hunt, was the first stop for our group. Some of us aren't great fans of roller coasters and one of us was just too short so three of us rode the Skyride instead, traveling round trip before the thrill seekers finished their ride on Cheetah Hunt. Cheetah Hunt was a huge hit, as was the Skyride, perfects beginnings for the day. Next we ventured over to Montu, for another coaster adventure. The tame members of our group enjoyed the sandbox instead. Despite the end-of-the-school-year groups visiting the park there was very little wait for Montu and the riders rejoined us in no time at all. We then traipsed through the Edge of Africa where we stopped and watched the hippos. I'm kind of partial to them, might have something to do with having a cat named Hippo. We were happy to see other animals as well - giraffes, tortoises, alligators, rhinos, elephants, but it was the hippo's that stole my heart. Lunch was enjoyed in Timbuktu, and was very reasonably priced, filling, and delicious. Lucky us, we arrived just as the Burn the Floor show was beginning. Wow, they can dance - we were most especially enthralled by dueling tap dancers dancing right on the dining tables. Bumper cars were Adam's #1 (and only) request for the day. River drove me around. Badly. Seriously, he may never be ready to get a driver's license ... thankfully we've got 10 years before it's a real issue. Then a visit to the tigers, complete with pop-up window into their enclosure. At this point in the day it rained. It's Florida, it happens most days. We sought refuge watching the tigers until the rain abated. We ended the day with the Iceploration Ice Show, which was just fantastic. Front row seats seemed like a bad idea until the show started - I was wrong. Perfect seats for a great show. The ice skaters were terrific, we commented as we were leaving that Busch Gardens had really top notch entertainers. We're already looking forward to going back soon, after Falcon's Fury opens (however, you'll find me on the ground, thank you very much!). Summer Nights begins June 28th. From June 28 through Aug. 17, guests can take advantage of extended park hours, special entertainment, high-energy DJs and the thrill of riding world-class coasters in the dark, as well as nightly fireworks. Florida residents have a really special offer available to them - purchase a 2014 Fun Card for unlimited general admission. Perfect for long summer days, as Busch Gardens has plenty of water rides and even a great kids water play area (River's favorite). Or purchase an annual pass for even more benefits (great for non-Florida residents too!). All Day Dining Deal - if you plan to eat more than one meal at the park this is a great way to go. We found, though, that the regular food prices were really reasonable and passed on this option for our visit as we were only eating lunch at the park. Quick Queue. Avoid the lines. It's that simple. For $35 you can cut to the front of the lines at the most popular attractions at the park, as many times as you'd like. I can't wait to hear about your Busch Gardens visits. Please share your stories in the comments below. 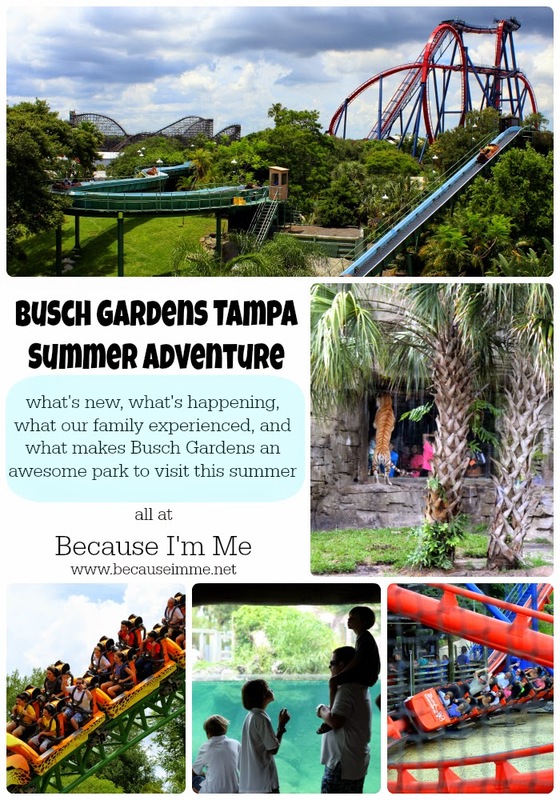 Busch Gardens, Tampa Bay provided me with tickets to visit the amusement park in exchange for a product review. However, all the opinions expressed here are my own.